Avingard didn’t make the decision to perform an attack on Fort Greymoor alone very easily. While he had fought many bandits in the past, a quick glance around Fort Greymoor proved that more bandits occupied this fort than all other forts and bandit hideouts Avingard had ventured into before. He quickly determined that fighting bandits as small groups would be the best approach than running into the middle of the fort. Slowly drawing his sword, Avingard moved towards the entrance to the fort. Above him, a bandit archer kept watch and then drew her bow as Avingard drew too close to the fort. “That’s close enough,” the archer above Avingard warned. Avingard ignored the warning and continued to make his way into the fort, hoping to draw out a bandit, or two. He succeeded when a single bandit archer came running towards him. Upon seeing the bandit running, Avingard backed out of the fort, but not too far giving the archer above him a clear shot. 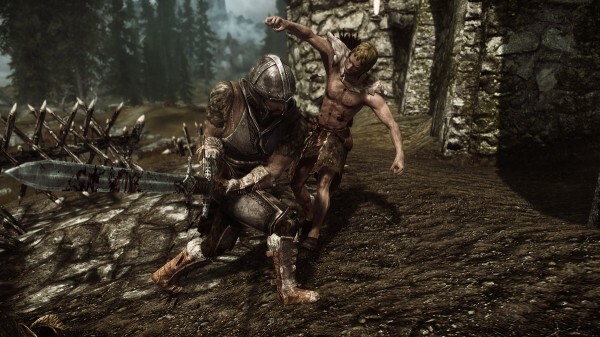 Before the bandit archer could draw his sword to begin melee combat with Avingard, he was struck down by a single swing from Avingard’s sword. Since it worked the first time, Avingard made a second attempt to draw out another bandit. Once again, a bandit came running towards Avingard with his sword and shield at the ready. Avingard again retreated out of the fort. This time, however, the bandit swung his sword causing Avingard to stumble back just far enough where the archer on the fort’s wall let loose an arrow. The arrow just barely missed hitting Avingard in the head. As the bandit swung his sword a second time, Avingard raised his sword to block it in mid swing. This caused the bandit to fall back and Avingard took advantage by thrusting his sword into the chest of the bandit, sending the bandit to the ground where he lay dead. Avingard entered the fort for a third time, which didn’t lead to anymore bandits advancing on him. Avingard then slowly traveled further into the fort and was surprised by an Orc bandit hiding among a stack of crates. The bandit lunged at Avingard, yelling in the process. As the bandit’s sword flew through the air, Avingard barely managed to meet it with his own sword. The clang of the swords caught the attention of the bandit on the wall, who then released an arrow, which just missed both the bandit and Avingard. Noticing that he was now out numbered two to one, and with an archer that he couldn’t reach, Avingard ducked behind the stack of crates to shield him from the arrows. The archer, seeming frustrated, began to move along the walls to find a clear shot of Avingard. The Orc bandit, meanwhile, began to move closer to the crates, although he couldn’t see Avingard. In a split second decision, Avingard lunged at the Orc bandit, catching him off guard. Avingard’s sword swung through the air, striking the bandit on the side of the neck, causing blood to spew out and the Orc to fall dead to the ground. By this time the archer had moved over to the steps leading up to the wall. Seeing this, Avingard charged up the steps and thrust his sword into the belly of the archer before another arrow could be released. The archer gave a gurgling sound and fell off the wall and onto the ground below. Looking around for more bandits, and seeing none, Avingard search the bodies of the dead bandits and collected whatever he thought could bring in some gold. He also searched the nearby crates, and then turned his attention to a door that lead a building of the fort. Entering the fort he noticed that he entered a dark room, that smelled of death and decay. He noticed metal bars that formed cells, so he figured he was in the fort’s prison. As he walked closer to examine the cell, a yell came from behind him. Out of the darkness a large Orc bandit came racing towards Avingard. The Orc bandit raised his sword and then swung it at Avingard, who just barely ducked out of the way, causing the sword to clang off the metal of the nearby cell. An Orc bandit in Fort Greymoor prison. Recovering from missing Avingard, the Orc bandit once again resumed his attack. 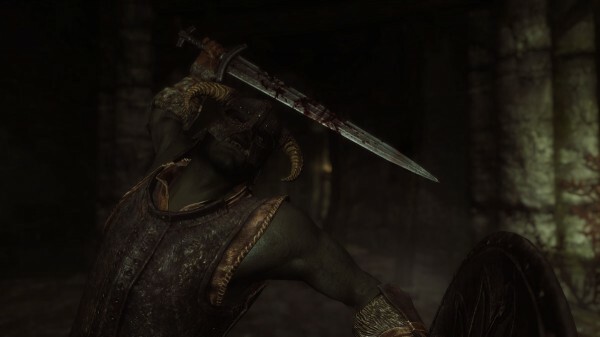 Avingard, having difficulty seeing the bandit in the darkness of the prison, raised his sword to block any attack from the large Orc. Swing and thrusting as he went, the Orc continued his attack for several minutes as Avingard blocked all of the attacks. the Orc began to tire from the attack, at which point Avingard began to counterattack with swings and thrusts of his own. Eventually a swing connected with the side of the Orc, and then another. As the Orc reeled in pain from the attacks, Avingard thrust is large sword into the Orc and sent the bandit to the ground motionless. Avingard slowly walked over one of the prison cells and notice the body of a man lying in the cell. He yanked open the door to the cell and examined the body. The smell from the body and the rotting indicated that the man had been dead for some time. Avingard left the body as it was. By this time the attacks had taken their toll on Avingard, as he began to feel exhausted. Not wanting to give up, however, Avingard continued to advance into the prison of the fort. He met a few more bandits along the way, including a magic users, but they weren’t nearly as difficult as the Orc he had just met. Eventually Avingard made his way to a large door, and opening it he noticed it went into another part of the fort, outside of the prison, however. He then stepped into a mess quarters where to bandits were sitting on benches at a large table talking about magic. As Avingard moved towards them one of them spotted him and jumped up and then drew his sword. The second bandit jumped up after seeing the first bandit get up, turned around and drew his hammer. Avingard lunged towards the second bandit, slashing and connecting with the bandits arm. The bandit fell back in pain, and Avingard raised his sword to finish off the bandit. Just as he was about to lower his sword, the first bandit had slashed at Avingard connecting with his side and causing Avingard to drop his arms in pain. His armor had taken the brunt of the attack, but Avingard could still feel the pain. The first bandit attempted to capitalize on his success by attempting to thrust his sword into Avingard. Avingard quickly move to the side to avoid the thrust and then swung his large sword around, striking the bandit in the side and causing the bandit to fall into a bench. By this time the second bandit had recovered from enough the initial attack by Avingard to start his own, but was repulsed by the Breton. Avingard finished off the bandit quickly and then turned his attention to the first bandit who was still struggling to his feet. Not wasting any more time, Avingard attacked the first bandit while the bandit was attempting to get up. The bandit tried to block as many of Avingard’s attacks as he could, but the attacks were too much and eventually several connected causing the bandit to fall dead onto the nearest table. Avingard quickly searched the bandits, and as he has done in the past, kept whatever he felt were valuable. Looking around he noticed a door that lead into a hallway. He stumbled over to the door and peered out into the hall. See no bandits, Avingard turned to his right to open a door when he heard some rustling from a doorway across the hall. Readying his sword, Avingard slowly moved towards the door and then entered. He couldn’t really believe what he saw – an elderly Nord woman sitting at a table. He approached the woman, who turned her head slightly to acknowledge Avingard’s presence. With that the Nord woman went back to drinking from a mug sitting on the table, ignoring Avingard. Confused, Avingard left the woman alone and went back into the hallway. He opened the door, which was to his left, and noticed it lead back outside. 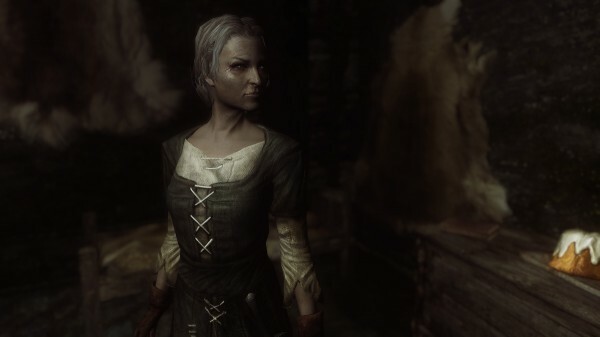 Not seeing anymore bandits, at least none that will post a threat to any travelers, Avingard once again continued his travel along the road to Solitude.